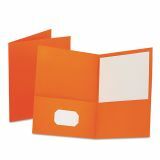 Oxford Twin-Pocket Folder, 100-Sheet Capacity, Orange, 25/Box - Back to school! 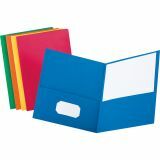 Twin-pocket folders offer generous pockets inside front and back covers to hold up to 100 letter-size sheets. Inside front pockets have convenient business card holders for instant personalization. Sturdy leatherette stock resists tearing.